I particularly like the composition of the second photograph with Hayley and the conductor. I chose that one as the thumbnail on our Facebook page. Unfortunately the audio is left channel only. Brilliant stuff! Can't wait for pro recordings of these! Hayley sounds so powerful in I dreamed a dream! Thanks for finding and sharing these photos, Jillian! I agree with Richard, the second photo of Hayley with the conductor in the background is excellent. That red dress is stunning...although I rather like that white dress. I'm very intrigued by that second photograph. It must have been taken with a long telephoto lens. I've posted that one and the video of 'I Dreamed A Dream' on our Facebook page. Thanks for the links, Graham and Libby! The quality of both videos is rather poor, so I won't post them on our Facebook page. I've posted 'I Dreamed A Dream' on our Facebook page because it's the complete song. What incredible performances. Some of the complaints of her first performance of I dreamed a dream was that she was to young to sing it with the right emotion and that she wasn't understanding the song. But now oh my goodness, although the first one was so pure and clean, this one is just perfect! I really hope there's a pro shot video of this soon! Thanks for the new and better videos! I disagree about the piano. It's nowhere near as effective as the orchestra, at least in the in between instrumental part. While she was singing it was okay, since all you really want to hear is Hayley. But it was boring by itself. The crowds gathered again, including a number of paying standees. They continued flowing in well after the starting time scheduled for 8 p.m.
Twenty minutes over the scheduled time an announcement promised the concert would begin within a few minutes. These dragged to a total of 45 minutes, with no explanation and never even the minor courtesy of an apology for such a dismal delay. Another oddity was the lack of a printed programme. Most patrons like having a programme to keep as a souvenir and if some of the pieces sung were announced by the singers and the titles projected on a screen, in the case of the opera pieces only the titles were projected, never a word as from which work and who composed it. If one of the aims of these concerts featuring Joseph Calleja and singers of other genres is meant to attract a wider audience from among the uninitiated, then the latter category of concertgoers needs be guided better. One must say, however, that once the concert started going these far from petty, latter irritations had to be put aside in between every reminder of their existence, mainly when our tenor took over the stage and the audience’s hearts. Mr Calleja has grown in artistic and professional stature with an increased dose of warm charisma. That voice remains a superbly beautiful and well-honed instrument with which he plays and performs with the greatest ease. All the makings of a great singer are there and as such makes even the more difficult pieces seem deceptively like easy cake. Each and every opera excerpt he rendered was a highlight. The sweet dreamy passion of Recondita armonia from Puccini’s Tosca and the heartfelt anguish of Mamma! Quel vino è generoso from Mascagni’s Cavalleria Rusticana were most touching, filling one’s heart with a warm, direct glow. The French repertoire suits Mr Calleja’s voice very well and he gave two excellent examples of this. First it was with Il était une foie dans à la court d’Eisenach from Offenbach’s Les Contes d’Hoffmann, with its shift in dramatic emphasis midway through the piece and the marvellous invocation Ah! Tout est bien fini… O souverain from Massenet’s Le Cid, a superb example of classy and stylish singing. Mr Calleja’s singing was no less impressive in the lighter field such as the well-handled tongue-twister which is Rossini’s La Danza, in Nino Rota’s Parla più piano, especially in its second half, and the decisively affirmative My Way, based on music by Claude François and Jacques Revaux. 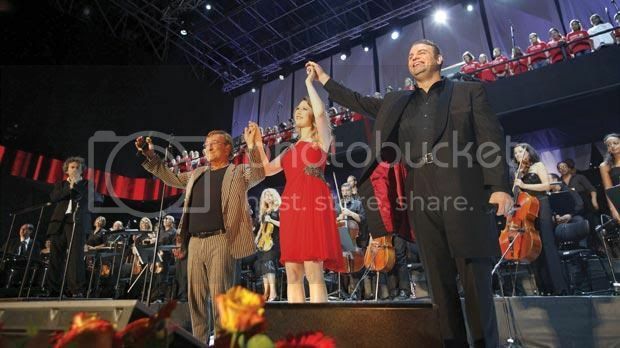 Angel-voiced Hayley Westenra delighted the audience with the crystalline and expressive beauty of her voice in C.M. Schönberg and H. Kretzmer’s I Dreamed A Dream from Les Misérables, which had been preceded much earlier by Prayer. Later she was simply enchanting in Whispers In A Dream, with her own lyrics to original music by Ennio Morricone (Gabriel’s Oboe) and just accompanied at the piano by Timothy Evans who came over specially from New Zealand. It was back with the orchestra when she sang Howard Shore’s May It Be, from Lord of the Rings and her last gorgeous solo, John Newton’s Amazing Grace. Lucio Dalla, a great Italian icon in the lighter genre, with his quirky and tongue-in-cheek manner and penchant for beginning most of his numbers in a semi-garbled vocalise also had his share of the limelight. He started with a slightly different version of his famous 4 Marzo 1943, not only as regards the vocal interpretation but also with a more earthy change of some of the lyrics. He sang a very direct Tu non mi basti mai, with Marco Alemanno providing some vocal harmony. It was the same Alemanno who recited the lyrics of Henna, an anti-war song penned by the cantautore, and which he sang to often purposely disjointed phrases on the piano and very soft string accompaniment. It was also inevitable that he would sing a series of his old war-horses such as the amusing, if a bit cynical, Anna e Marco, the reflective Se io fossi un angelo and the very entertaining Attenti al lupo. In his solo pieces the very versatile orchestra was conducted by Beppe d’Onghia. 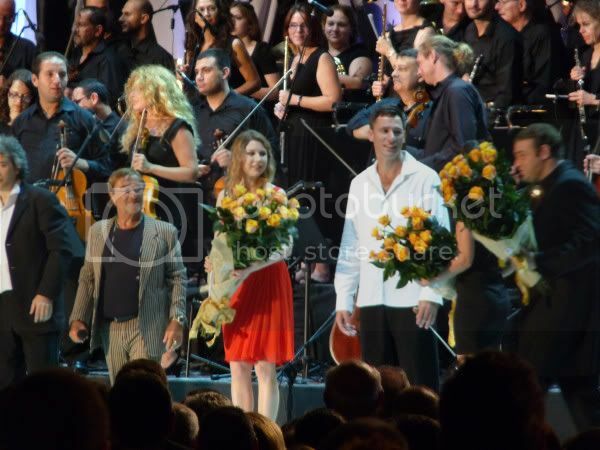 Equally inevitable was his Caruso, which he sang with Mr Calleja, and which the latter dedicated to the memory of the late President Emeritus Guido de Marco. The latter added a glorious lustre to this supremely beautiful work. Not surprisingly, it was to be encored later, with Mr Dalla being more comfortable in it than the first time round. Meanwhile, the three singers sang in a number of duets, the first being Ms Westenra and Mr Calleja in the charming All I Ask Of You from Lloyd Webber’s Phantom of the Opera, the opening bars of which were slightly too deep for comfort for the tenor. The same duo sang the Bach/Gounod Ave Maria which Mr Calleja dedicated to the late Mary Fenech Adami. The concert ended with a standing ovation as did each of the encores which followed. The two gentlemen teamed up in Nessun Dorma with Mr Calleja bearing the brunt with ease and again sang O sole mio together. Mr Calleja and Ms Westenra sang another version of Morricone’s Prayer, and the only trio came with the balmy Santa Lucia. Mr Calleja sang Queen’s Who Wants To Live Forever, with the last, definite encore being with Mr Calleja and Mr Dalla singing Caruso. The HSBC Children’s Choir was very well coached and directed by Gillian Zammit. They took part in a good part of the programme and opened each half of the concert, with Morricone’s The River and Verdi’s Và pensiero respectively. Led by Marcelline Agius, the MPO was in fine fettle and responded well to Charles Olivieri Munroe’s direction, a director with whom the MPO has worked before. Inevitably, in such an open space, there has to be amplification so one’s ears have to get used to conditions vastly different to those in a concert hall. There was mercifully little noise from (faraway) fireworks so one considered oneself lucky the evening went as it did in this respect.